Every so often, some ill-informed person opines that we don’t need Black History Month, or International Women’s Day, or LGBT History Month, or the BET Awards. Sure, we wouldn’t need any of them if white privilege, male privilege, and straight privilege didn’t exist. But they do exist. People who argue that Black history has been “relegated” to Black History Month are missing the point. Prior to the creation of a special month, Black History was completely ignored, except as a footnote to white history. 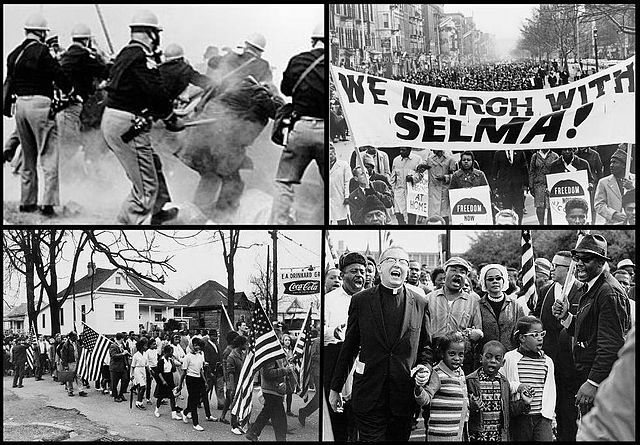 The month is an attempt to get a foot in the door – a door that was previously slammed in the face of Black history. If “mainstream” history didn’t focus almost exclusively on straight white men, then we wouldn’t need days or months that focused on the people who are usually left out of the history books. But only recently, a British student launched a petition to persuade an exam board in the UK to feature female composers on the GCSE music syllabus. The petition was successful, but she shouldn’t have needed to create a petition: it should have been obvious that female composers should be included. A great deal of art, music, and literature has been produced by women, Black people, and LGBT people, yet school, college, and university syllabuses frequently focus exclusively on art, music, and literature produced by straight white men. 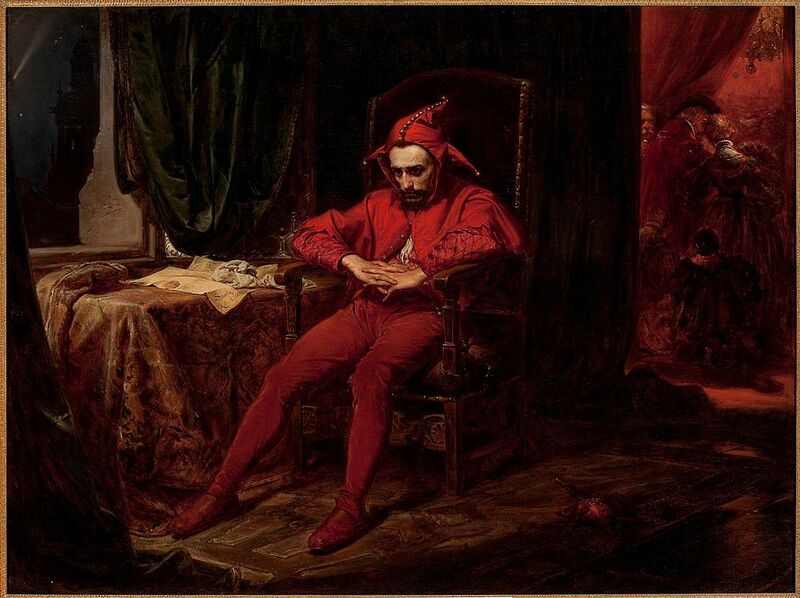 It is not that the artistic productions of straight white men are superior to those produced by Black people, women, and LGBT people – it is because the straight white male view of the world is deemed normal and normative, and anything that doesn’t fit within it is deemed niche or uninteresting. No other people see history in quite the same way because no other people have had their history so comprehensively denied and disavowed. Among the many justifications for slavery, and later for the colonisation of Africa, was the assertion that Africans were a people without a history. The German philosopher Hegel, writing in the 1830s, claimed that: “Africa … is no historical part of the world.” Other peoples have seen their cultures dismissed as backward or barbarous, but the antiquity of those cultures has rarely been so repudiated. The erasure of African history and culture is similar to the erasure of the stories of the pagan cultures of antiquity. Only cultures that built in stone and used writing were deemed worthy of the lofty title of ‘civilisation’. Only cultures that were Christian were deemed civilised – everyone else was just barbarian hordes. So why does this ignorance persist, 25 years after Black History Month was launched in Britain? This month we’ve seen events that range from the sublime, such as the award-winning American musical The Scottsboro Boys, to the tokenistic. At my children’s school, many heart-warming pictures of Nelson Mandela, Desmond Tutu and Doreen Lawrence have been produced, as well as innumerable portraits of black sportsmen from Usain Bolt to Theo Walcott. At a friend’s school, the pupils have been encouraged to turn up dressed as a black pop star. Most of our children have become familiar with the travails of Mary Seacole. But these stories of individual triumph, however uplifting, don’t do nearly enough to fill the knowledge gap. We need to integrate black history across the educational curriculum, and among adults, so that people like our prime minister will also comprehend it. There’s no doubt that black British history, as celebrated during Black History Month, has helped thousands of black children understand their place within the British story. Each year it provides journalists and broadcasters with a topical hook on which to hang stories about black people and black history that might otherwise go untold. And the stories of remarkable men and women – from Britain and around the world – become counterweights against the tsunami of negative stereotypes that wash over black children growing up in this country. But the problem is that biography, especially heroic biography, can at times displace and obscure history rather than explain or deepen it. This is because the life stories of the men and women who make up the pantheon of black heroes are not wide enough, even when viewed together, to encompass the global scale and variety of black history. The promotion of history as the story of straight white men erases and denies the oppression suffered by Black people, LGBT people, and women, and erases and denies their struggles to overcome that oppression. That is why I support Black History Month, and especially Crystal Blanton’s Thirty Day Real Black History Challenge. It is why I support LGBT History Month and International Women’s Day and Women’s History Month. Black History Month is in November in the UK, and in February in the USA and Canada. LGBT History Month is in February in the UK, and in October in the USA. Women’s History Month is celebrated during March in the USA, the UK, and Australia, to include International Women’s Day on 8 March, and during October in Canada. When I posted my recent post about making a meditation hut, a friend posted a link to an article in The New Yorker, entitled “Pond Scum: Henry David Thoreau’s moral myopia.” It shows that Thoreau was the worst kind of misanthrope, and had not an iota of compassion for his fellow human beings. 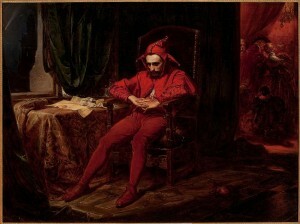 He remained unmoved by the sight of drowned bodies from a shipwreck. He only advocated the end of slavery because it violated his belief in self-governance . He clearly advocated disappearing into the woods, not so one could emerge refreshed and renewed for the struggle against oppression, but because he really didn’t like or care about other people at all. I wasn’t advocating building a meditation hut as a sturdy structure for keeping the world at bay – more a place where you could meditate when it’s raining, perhaps spend a few hours or days living the simple life, not a permanent retreat from the world. If you go into the woods, the aim is to be more connected with the whole of Nature, including humans, not to become detached from all other beings. The point is for those of us who are a bit introverted to recharge our batteries by spending some time alone, so we can be companionable and compassionate when we emerge. Spirituality – embodied or otherwise – is merely narcissism and self-indulgence when it doesn’t involve compassion – literally, feeling with others. I regard embodied spirituality as a sense of mystical connection with the universe and all beings within it. In feeling this sense of connection, we experience compassion for the sufferings of other beings, and empathy with their joys. We can enhance this sense of connection by finding a community with whom we can practice compassion and mindfulness; if we don’t engage in spirituality in a group setting, it can become self-centred and shallow, disconnected from everyday reality. We need the experience of actually living and sharing with others to enable us to grow and become our authentic selves. This can be done by the creation of a community of shared values, which models in microcosm the desired qualities of human community. Of course there will be conflicts and tensions, but it is in how these are resolved that the real values of the community will be tested and refined. It is only by this kind of radical openness and humility that the community can become strong and genuinely inclusive. I believe that the religious life is a shared spiritual journey towards greater communion with the cosmos, where Spirit descends into matter rather than escaping from it – but this communion does not involve the effacement of individuality; rather it is the celebration of diversity and the quest for authenticity, because the “divine” (the vision of ultimate worth) is the potentiality of all life to share in mystical communion. But we must expand our compassion to all beings, not just to those whose values we share, and we do this by engaging in social action – caring for the poor and the oppressed, protecting the environment, standing up for human rights, and promoting freedom, peace and justice. We cannot really expect others to be convinced that we are “mystical” or “spiritual” unless we put compassion into practice by helping others. The two aspects of religion go hand-in-hand: without a sense of connection there is no basis for compassion, and without the expression of compassion in the form of caring, the life of a mystic can be barren and unproductive. In a Pagan context, we might view the theological underpinnings of compassion as our view that divinity is immanent in the world, and everything carries a spark of divinity within it. Alternatively, we could take a naturalistic approach and recognise that everything on Earth shares at least 60% of our DNA – we really are all related. And we could combine these two ideas. My theological basis for compassion is a religious basis, but it is also a naturalistic basis. Intuitively, we feel an obligation to help those who help us, first of all the families who give us life and who support us when we are young and vulnerable. We feel an obligation to help our close relatives, our neighbors, and our families of choice. We are social animals and we know we cannot survive alone – we need the help of others, and they need our help. But beyond the practical aspects of compassion lies the recognition of kinship, of looking into the face of another and seeing ourselves. That person is like me, therefore she feels pain and joy just as I do, therefore I should help her feel joy and prevent her from feeling pain. I would argue that compassion for beings beyond our immediate kinship group is what makes us human and humane. If you cannot feel kinship for the suffering of other beings, that isn’t very “spiritual”. I find it horrific that Thoreau could walk along a beach full of drowned corpses and not see fellow human beings, only a “spectacle”. I find it horrific that people can look on the sufferings of Syrian refugees and see only ‘flotsam and jetsam’, or the threat of the Other. The ancient virtues of hospitality and reciprocity are core values for many Pagans, and these are, in many ways, related to compassion. For me, one of the great things about being manifest in the physical world is the giving and receiving of love in physical form: hugs and caresses, and making love. And whilst it is true that love means that you will suffer when the loved one dies, I feel it’s true that “it is better to have loved and lost than never to have loved at all”. Love and reciprocity are the basis of all of existence, because it’s all about creating connections between beings. In the Feri creation myth, the universe came into being because the Great Goddess looked into the mirror of the void and fell in love, and the love created the Other. So love is the origin of the universe, and love is part of the fabric of existence. We experience feelings (grief, love, dread, joy, fear) in our bodies. We talk about “a gut feeling”. Compassion is embodied like other feelings. It turns out that this has a neurological basis in mirror neurons – we quite literally empathise with other people’s pain because our mirror neurons respond to them. Physical existence entails a certain amount of suffering (bodily pains, the loss of loved ones) and also a certain amount of joy. The Pagan response to this is to celebrate the joy and accept the suffering as part of embodied existence, whilst trying to relieve suffering. It’s not much use being compassionate unless you put it into practice, of course. Unless we actually help people, merely empathising with them is not enough. How far does compassion extend? Compassion is not only fellow-feeling for other humans, but also for animals and birds: all our relations. The Charter for Compassion would benefit from a “green clause” to emphasise caring for the Earth and our fellow creatures. Although there is a section on their website about treating the Earth with compassion, it hits a discordant note for me, as we need to recognise that we are part of the Earth, not regard it as a separate system from ourselves. Another charter, the Earth Charter, drafted back in 1968, placed caring for the planet at the heart of its ideas. And A Pagan Community Statement on the Environment also placed the Earth at the heart of its concerns. 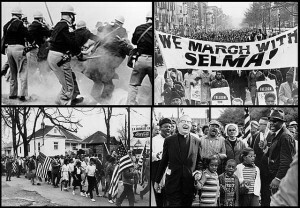 In my view, social and environmental justice are inextricably bound up with each other: you can’t have one without the other. The other day, I saw a meme which said that you don’t need magical tools, initiation, or a Book of Shadows to be a Wiccan. 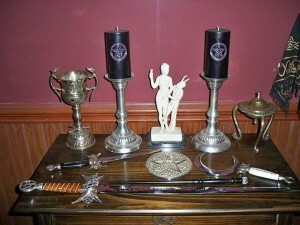 Well, maybe you don’t need these things, but they are what people think of when they think of Wicca. They are among the things that get you recognised as being part of the Wiccan community, because they are symbols and experiences and ideas that we all share. They are also useful. You don’t need a knife and fork to eat your dinner, but it makes it a lot easier. You don’t need an address book to write your friends’ addresses in – but it makes it a lot easier to remember where they live and post them Yule cards. And you don’t need a rite of passage to help you feel like an adult – but it makes it easier if a definite transition has been marked. I would like there to be as broad an interpretation of the term “Wiccan” as possible, and an even broader interpretation of the term “witch”, because that is how they were originally intended to be used (the term Wiccan was not coined exclusively for the use of Gardnerian Wiccans, or even Alexandrian plus Gardnerian – it was intended to refer to all witches, as Ethan Doyle White has shown from his historical research). 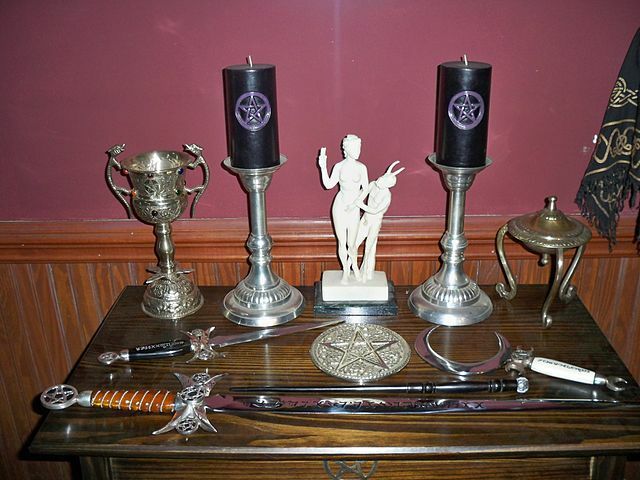 I am okay with people identifying as Wiccan without initiation – but if you want to be part of the initiatory Wiccan community, or another initiatory community such as Feri, then you need initiation. Initiation is a powerful transformational ritual. The purpose of a Book of Shadows is not to prescribe how you should do your rituals, but to record powerful rituals that you have done, and to transmit powerful rituals written by past Wiccans. Each witch’s book should be unique to them, although it will also contain the rituals that have been passed down to them. A Book of Shadows is a magical tool for recording and transmitting good rituals. What about tools such as wands, athames, swords, chalices, and so on? There are several reasons why they are helpful. I do think that a good witch should be able to do a spell or ritual without any tools in an emergency – but I still use tools when they are available. Wiccan Altar, by Fer Doirich – Own work, CC0. Humans are tool-using animals. One of the things that helps us to think and solve problems is our tool-using propensities. Look at other animals who use tools. We tend to think they are cleverer than animals who don’t use tools, because they can manipulate more of their environment. The last decade has witnessed remarkable discoveries and advances in our understanding of the tool using behaviour of animals. Wild populations of capuchin monkeys have been observed to crack open nuts with stone tools, similar to the skills of chimpanzees and humans. Corvids have been observed to use and make tools that rival in complexity the behaviours exhibited by the great apes. Excavations of the nut cracking sites of chimpanzees have been dated to around 4-5 thousand years ago. Think about how we use physical tools such as screwdrivers, hammers, brooms, milk-frothers, egg-stiffeners, paint-stirrers, and so on, and how difficult life would be without those tools. Think about how chimpanzees have been seen getting ants out of ant-hills with a straw, or cracking nuts open with a rock. Frequently, tool use involves remembering that you saw a useful-looking rock, or a hollow blade of grass, going to fetch it, and bringing it to where the food is. So tool use involves the use of cognitive skills such as memory, comparison, and visualisation. My partner Bob pointed out that it is much is easier to do a task (magical or mundane) without a tool when you have learnt to do it with a tool. Tools are levers for affecting the world. You can’t tighten a screw without a screwdriver. You need a wooden spoon to stir a pan of soup or stew, otherwise you would burn your fingers. You can cast a magical circle without a sword or a wand – but it feels like a better and more magical circle when it has been cast with the appropriate tool. The subtle energies involved in magic are affected by physical tools in much the same way as denser matter is affected by tools. Magic is not all in the mind – the body is part of it too. The people who claim you don’t need tools also tend to claim that doing magic is a purely mental process. The conceptual separation of mind and body, spirit and matter, is a Western phenomenon which has been a disaster for our civilisation in so many ways, involving the denigration of sexuality and sensuality, the denial of the pleasures of the flesh, a dysfunctional relationship with food, and behaving as if the Earth, the other animals, birds, and plants with whom we share it are expendable. Using magical tools helps to remind us that magic is an embodied spirituality, and to involve our bodies in the process of creating magical energy. Indeed, some of the tools used in Wicca have specific uses for enhancing the sense of being in the body. Tools are powerful symbols. Much of magic and ritual is about engaging with and awakening the poetic and symbolic aspects of the mind (the “right-brain” functions). The use of tools as symbols speaks to these aspects of the mind (sometimes referred to as “Younger Self”). Tools are part of a complex set of magical associations involving directions, elements, planets, deities, trees, and so on, all of which speak to the poetic, mystical, and symbolic side of our natures. They are part of a poetic language of witchcraft. The process of getting into the twilight consciousness required for ritual is assisted and enhanced by the use of familiar words, tools, imagery, and physical movements, evoking muscle memory and awareness of space. So, maybe you don’t need tools, but why would you want to do without them? I have always liked the description of Paganism as nature religion (however inaccurate and unhelpful that may be). The idea of being connected to Nature was one of the things that drew me towards Paganism. I also really liked the old gods, but woods, mountains, the sea, chalk hills, ancient trackways, burial mounds, stone circles, and liminal places have always attracted me. I think I first tried talking to trees when I was about 12 years old. I get withdrawal symptoms if I don’t get out into the countryside regularly. So I also feel the urge to converse with the spirits of the land. 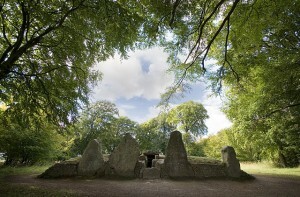 “Wayland Smithy Long barrow” by Msemmett – Own work. Licensed under CC BY-SA 3.0 via Commons. The Otherworld does not consist only of deities. There are also land wights, landvaettir, genii loci, land spirits, and spirits of the hearth and home. If you want to be in relationship with deities, it is a good idea to talk to your local land spirits, ancestors, and household spirits. Deities exist in the context of other spirits. A lot of people feel pulled into Deity work right away, when the first thing they should be focusing on is developing a strong relationship with their ancestors and with the spirits of the land on which they live. … developing strong relationships with both your ancestral dead and with your local land spirits is excellent training for working with Deities down the line. … Honoring the land spirits is something we can do to begin bringing ourselves back into balance with the natural world. As a species we have much to atone for and starting to treat the earth as powerful and sentient is a good start. Start by identifying the sacred places in your local area, such as hilltops, hollows, wells and springs, crossroads, and other liminal places. Then go and spend time in those places, and feel the energies and presences there. If you leave offerings, it is best to leave inconspicuous ones that don’t harm the environment or the animals and birds that live there. Rather than tying ribbons to trees, tie a strand of your hair to a branch instead. Rather than leaving flowers or crystals, make a temporary mandala of leaves, pebbles, pine-cones, twigs, and/or berries that you find on the site. Even better, clear up any litter on the site. Many people in North America are worried that if they approach the land spirits, it will be cultural appropriation. But you need to devise your own rituals for approaching them, not appropriate the rituals of First Nations people, which probably won’t fit in a Pagan context anyway. Honor the spirits of the land. Speak to them: address them respectfully and introduce yourself. More importantly, listen for them. Make offerings, but be wary of assuming traditional Native American offerings like tobacco and cornmeal are required or even proper. Honor them in your way. Not sure what that is? Ask them. When it doubt, clean water is always appropriate. When I made contact with the land spirits of Ontario in a ritual, they seemed really keen to talk to me, so I feel that trying to enter into relationship with them is a good thing. As other authors have emphasised, you just need to be respectful and not try to use Native American terminology or offerings, unless you are specifically invited to do so by Native Americans themselves. Making contact with land spirits in Britain and Europe is even easier (because these are not colonised lands, unless you live in the northern regions of Scandinavia) – just go into the landscape and listen. Finding a sit-spot and going there regularly is a very good way of connecting with a particular place. When you go to a sacred place in the landscape, always approach it with respect and ask the local spirits for permission to be there, especially if you are planning a ritual. What I do is pause at the entrance to the site, ask if it is okay, and wait for a sense that it is alright to proceed. One of the finest books on Paganism I have ever read is The Art of Conversation with the Genius Loci by Barry Patterson. It explains in some depth how to see things from a non-human perspective, how to relate to your local landscape, and how to make connections with the land and the spirits that dwell there. It is so good that I have said to people, “if you only read one book about Paganism, make it this one”. Each landscape (especially in Britain with its very varied geology) is unique, and takes some getting to know. There is the geology, the flora, the fauna, the history, the folklore, and the archaeology (a palimpsest of human occupation and land-use). Take your time to get to know all of these, and to connect with all of it. Building and repairing relationships with land spirits entails doing something to repair our relationship with nature as a whole. This will mean different things for different people. Personally, I have felt much more attuned to Nature since I stopped owning a car. Your approach may be different, and I don’t presume to dictate what it should be. Here is a poem I wrote about Danehill Barrow in Cambridgeshire, England, many years ago. I dredged the ditch of history. dreaming the land into being. waiting to enclose the seed. Last weekend, I saw the Gundestrup Cauldron. It was an amazing, powerful, beautiful experience. Seeing something that I’ve waited so long to see, something so old, and so powerful, of such exquisite craftsmanship. It was awesome. Cernunnos sitting there with his antlers and his snake, all beautiful and serene. And the embossed panels, and the tiny details like the embossed leaves, and the silver of at the bottom of the cauldron. Amazing. So sacred. And containing such a wide range of influences from different cultures. Gundestrup, Denmark. 150-0 BC This cauldron is made from 13 silver plates. The hammered and gilded plates weigh almost 9 kg. On the outside, large deities are accompanied by small humans, animals and mythical creatures in pairs. Interior shows scenes populated with many figures, both human and animals. One of them shows a parade of warriors carrying a carnyx, a Celtic trumpet. 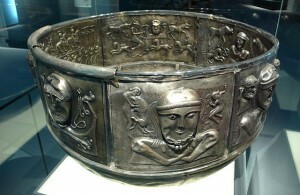 Art of the Celts, Historic Museum of Bern. Photo by Rosemania, CC BY 2.0. Yes, I know that the name Cernunnos is known only from one inscription, and we don’t know the name of the antlered deity on the Gundestrup Cauldron, but I chose to use his name rather than the more impersonal epithet “horned god”. And technically, it isn’t a cauldron – it was a feasting bowl rather than a cooking pot, but archaeologists refer to these vessels as cauldrons. The Gundestrup Cauldron has been gracing the British Museum in London recently, as part of an exhibition entitled “The Celts: art and identity“. If you haven’t been able to get to it in London, it will be at the National Museum of Scotland from March 2016. There were loads of other iconic objects in the exhibition too: the Basse-Yutz flagons, the Battersea Shield, the Wandsworth Shield, hoards of gold and silver torcs, some amazing deity statues. There was a bit of a lack of any attempt to set these items in context alongside everyday objects and how they were used – but the objects in the exhibition were really spectacular, and I would happily have paid £16.50 just to see the Gundestrup Cauldron, and the aim of the exhibition was to show how identity is expressed through art, not to show the everyday life of “Celtic” peoples. The music in the exhibition room was really annoying, but the ceiling hangings (apparently meant to represent the Northern Lights) were quite groovy. The exhibition very clearly showed how the meaning of “Celt” changed over time – and how there is no single ethnic group that may be referred to as “Celtic”. Being “Celtic” has more to do with language and culture than it does with ethnicity or genetics. It seems to be a tendency in much of contemporary culture, including the Pagan movement, to put people on pedestals and hero-worship them, and when we discover that they are flawed human beings like the rest of us, to knock them off their pedestal and dismiss every good thing they ever did. Sure, a genuinely wise elder is a pleasure to learn from and to be around, but that doesn’t mean the rest of us should put them on a pedestal and assume that they can never do anything bad. This encourages them to avoid seeing their own issues and to assume that they can do no wrong. That is dangerous because then they have too much power, and also means that when they do something wrong, it is hard for anyone to challenge it, knowing that the person will be completely knocked off their pedestal, instead of just taken down a peg or two. It means that people are less willing to believe that a community leader could have done something bad. It means that calling someone out for a bad thing they did whilst acknowledging the good stuff they did becomes harder and harder to do. The more we think in this binary either/or way, the harder it becomes to see nuance and put things in perspective. But, in order to progress as a movement (and for society in general to progress), we need to be able to challenge bad behaviour, and to set boundaries to prevent it, without dismissing the person completely. Obviously some behaviours are so terrible that they are grounds for ejection from the community. I’m talking about one-off instances of bad behaviour, not a string of repeat offences. When someone repeatedly behaves badly, then it is time to call them out. Surely the answer, then, is to be more realistic in the way we treat elders. Loved and respected for their wisdom and/or their contributions to the community, yes. Put up on a pedestal and assumed never to do anything wrong, and therefore not held accountable for their actions, no. Ejected into the outer darkness for the slightest transgression, no. The higher we put them on those pedestals, the harder they fall. The answer? Don’t put them up so high in the first place. The only reason that people get to be leaders in the first place is because others give them power, and because they have some quality that makes them leadership material – knowledge, or wisdom, or charisma, or the ability to make others feel safe. All of those are worthwhile and valuable qualities, and a good leader or teacher or elder has those qualities: that does not mean that he or she should be ruling their group with a rod of iron. A good teacher empowers others to develop those qualities. It is also noticeable that many Pagan leaders have ended up suffering from spiritual burnout from taking on far too much work. This is perhaps because people have seen the high cost of leadership (the flak that leaders get for sticking their head above the parapet) and don’t want to go there. I think that a shift to a less binary way of looking at leaders and elders would help with this issue too. We are generally quite an egalitarian movement – but the shadow side of that is wanting to knock people off their pedestals if we think they have got too big for their boots. But if we remembered that they are just flawed human beings like us, and didn’t elevate them so high, then they wouldn’t fall so hard. Many people think that the Pagan or Earth Spirit element in Unitarianism started around 1980 with the first Unitarian Universalist Pagan ritual, or with the foundation of CUUPs (Covenant of Unitarian Universalist Pagans) in America in 1986, or the Unitarian Earth Spirit Network in the UK, founded in 1990. In fact, it has its roots in some much earlier developments. We ask, then, for peace for the gods of our fathers and of our country. It is just that all worship should be considered as one. We look on the same stars, the sky is common, the same world surrounds us. What difference does it make by what pains each seeks the truth? We cannot attain to so great a secret by one road. Paganism is generally tolerant of different viewpoints because most Pagans believe that everyone has their own unique path to walk, and that there is a vast array of deities. Unitarians are tolerant because they tend to believe that everyone’s experience is unique and different religions are different perspectives on the same underlying reality. Michael Servetus (often regarded as the first Unitarian martyr) decided on the unity of God in part because he had been reading Hermetic texts, according to Earl Morse Wilbur, author of a history of Unitarianism in two volumes. The Hermetic texts were a loose compendium of Platonist and Neo-Platonist texts from late antiquity (the last days of the ancient pagan world). Some pagan thinkers of antiquity held that there was a divine unity. Two key strands in Unitarian thought were Deism and Natural Religion. Deism in the philosophy of religion is the standpoint that reason and observation of the natural world, without the need for organized religion, can determine that a supreme being created the universe. Further the term often implies that this supreme being does not intervene in human affairs or suspend the natural laws of the universe. Deists typically reject supernatural events such as prophecy and miracles, tending to assert that God (or “The Supreme Architect”) has a plan for the universe that is not to be altered by intervention in the affairs of human life. Deists believe in the existence of God without any reliance on revealed religion, religious authority or holy books. … Deism became more prominent in the 17th and 18th centuries during the Age of Enlightenment — especially in Britain, France, United States and Ireland — mostly among those raised as Christians who found they could not believe in supernatural miracles or the inerrancy of scriptures, but who did believe in one God. The Founding Fathers of the United States were heavily influenced by Enlightenment philosophies, and it is generally believed that many of them were deists. Most deists saw the religions of their day as corruptions of an original, pure religion that was simple and rational. They felt that this original pure religion had become corrupted by “priests” who had manipulated it for personal gain and for the class interests of the priesthood in general. According to this world view, over time “priests” had succeeded in encrusting the original simple, rational religion with all kinds of superstitions and “mysteries” – irrational theological doctrines. Laymen were told by the priests that only the priests really knew what was necessary for salvation and that laymen must accept the “mysteries” on faith and on the priests’ authority. This kept the laity baffled by the nonsensical “mysteries”, confused, and dependent on the priests for information about the requirements for salvation. The priests consequently enjoyed a position of considerable power over the laity, which they strove to maintain and increase. Deists referred to this kind of manipulation of religious doctrine as “priestcraft”, a highly derogatory term. Deists saw their mission as the stripping away of “priestcraft” and “mysteries” from religion, thereby restoring religion to its original, true condition – simple and rational. In many cases, they considered true, original Christianity to be the same as this original natural religion. The original, simple and rational religion was known as the Urreligion or natural religion. Many early Unitarians were Deists (particularly the signatories of the American Declaration of Independence) and were accused by their contemporaries of atheism. Deists believed that religion was natural to humanity, and that God was accessible to reason. They looked for an original form of religion from which all current forms had decayed or evolved. Hence many of them were interested in ancient Greek religion, and also in Druidry, believing it to be a form of the ancient Hebrew religion which had been brought to Britain by the Phoenicians. Hence, when Unitarianism in Britain officially began, it was not long before it attracted the attention of one Iolo Morganwg, who had earlier written a huge collection of material for the nascent Druid movement, and went on to become a Unitarian minister and to write many of the hymns used in the Welsh Unitarian hymnbook. At that time ancient druidry was thought to have been a debased form of the Hebrew religion, brought to Britain by the Phoenicians, so it is hardly surprising that Morganwg became interested in Unitarianism. Nevertheless, the Druid movement of which he was one of the founders has evolved into the modern Pagan Druid movement. Ronald Hutton’s comprehensive work on the druids shows that there was hardly any evidence of what the druids were like; the only evidence available was from Roman sources, but there was hardly enough there to reconstruct a religion that looked anything like druidry. Druids did not generally identify themselves as Pagans until the early 20th century. Before that, druid orders had names like the Universal Bond, and their views were universalist rather than pagan, in other words, they believed that there was an essential element in every religion that was the same – a mystical core of religion. Contemporary Druidry is part of the Pagan revival. Druid and Pagan beliefs range from non-theism to animism to (neo-)shamanism to duotheism (a god and a goddess) to monism to polytheism. Most Pagans feel a sense of connection to the land, the Earth, and/or Nature. A number of Druid orders are drawn to ancient sites because they feel connected to their builders and former users. Some Druids consider themselves to be the successors of the ancient druids described by Julius Caesar and others, often using arguments of dubious intellectual provenance, as we know almost nothing about what ancient druids did or believed. A key theme in Druidry (particularly at the festival of Samhain) is the connection with ancestors, usually defined as including one’s personal kin, the people who once dwelled in the place one lives in (house, village, town, region), and spiritual kindred, that is, inspirers. There are two main strands of Druidry, the countercultural (associated with road protests and similar events, and sometimes clouded by a reputation for public drunkeness) and the more retiringly ‘spiritual’ (who tend to be more middle class). There is much overlap between the two strands. 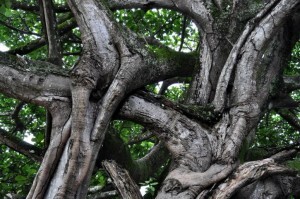 Druidry and the Pagan revival are very diverse and cannot be easily pigeonholed. Contemporary Pagans are drawn from a range of backgrounds and include some professionals and scientists. Another non-Christian who became interested in Unitarianism – and became in the process a major influence upon it – was Raja Rammohun Roy. He had had encounters with various Christian missionaries in India, but found their arguments unconvincing. Tired of Hindu stories of half-human half-deities, he was not minded to accept the divinity of Jesus, and argued that Jesus was human and not divine. He founded the Unitarian Society of Calcutta and the Brahmo Samaj (One God Society). He also translated the Upanishads and Vedas (Hindu scriptures) into English, and it was probably he who coined the word “Hindu”. He corresponded with Unitarians in Britain and eventually travelled here to ensure that the government did not repeal the law banning widow-burning, which he and others had campaigned so hard to abolish. Sadly he died here and is buried in Arnos Vale Cemetry in Bristol. His writings influenced many Unitarians. Whilst he was in England, Roy toured the country and met many people of all walks of life, including George IV (whose coronation he attended) and Jeremy Bentham, who had Unitarian sympathies and many Unitarian friends. Roy presented three papers on the Revenue System of India, the Judicial System of India and the Material Condition of India to a committee of the House of Commons. He addressed the Unitarian annual meeting in London, and was invited to Bristol by the Reverend Lant Carpenter, where he stayed at Mary Carpenter’s home until his untimely death from meningitis on 27 September 1833. He was buried in Arnos Vale cemetery in Bristol, and an annual service is held at his tomb, conducted by the Unitarian minister of Bristol. The Brahmo Samaj are regular attenders at this event.A statue of Rammohun Roy (paid for by the Indian government) was erected in central Bristol in 1997. Roy’s visit also had political implications, in that there was some talk of him standing for Parliament, and his association with radical dissenters like the Unitarians was of considerable assistance in their agenda of reform and the disentanglement of church and state (Zastoupil, 2002: 220). Roy’s deist views, his struggles with Hindu orthodoxy and debates with Baptist missionaries over the doctrine of the Trinity and the nature of Christ, and the fact that his family was said to have disowned him for his views, all resonated strongly with the Unitarians of the 1820s and 1830s, who faced persecution by the authorities (the 1689 Toleration Act was not extended to them), legal disputes over chapels and endowments, frequent blasphemy charges, and public objections to their involvement in politics and campaigning (Zastoupil, 2002: 230). Unitarians have often found Nature inspiring and viewed the Divine as immanent in Nature, perhaps drawing on Spinoza’s ideas of God as Nature (Deus sive Natura). 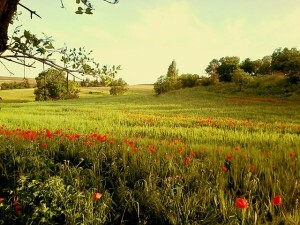 “Beautiful nature Before sunset” by ABDO2008.DZ – Own work. Licensed under CC BY-SA 3.0 via Wikimedia Commons. Coleridge, the Romantic poet, was a Unitarian originally and preached in several Unitarian chapels. He also employed a lot of Nature imagery in his poems, and many of them were pantheist in tone. Diffused through all, that doth make all one whole . . .
James Martineau spoke for many other Unitarians when he included the works of Coleridge in a short listing of his personal ‘sacred guides’. And perhaps his famous view of the Incarnation could have been influenced by these Religious Musings. The most obvious way in which Unitarianism has influenced contemporary Paganism is through the Transcendentalists (a group of Unitarians from New England). Ralph Waldo Emerson, who began the Transcendentalist movement, had read the writings of Rammohun Roy, and was deeply influenced by them. The Transcendentalists argued that true religion and spirituality transcend the dogmatic cultural forms of religion; they took their name from Immanuel Kant’s Critique of Pure Reason. The key players in the Transcendentalist movement were Ralph Waldo Emerson, Henry David Thoreau (author of Walden, an account of his attempt to return to Nature by living in a small hut by Walden Pond), and Bronson Alcott, educator and father of Louisa May Alcott, author of Little Women. Many of Emerson’s and Thoreau’s ideas fed into modern Paganism; for example the idea of polarity (on which Emerson wrote an essay) is very important in Wicca; and the idea of retreating to a simple hut, as Thoreau did, influenced Ross Nicholls, founder of the Order of Bards, Ovates and Druids, to advocate retreating to a simple hut (perhaps he got the idea from the poem by WB Yeats, The Lake Isle of Innisfree, but that was inspired by Thoreau). Emerson’s own writings were widely read, and he became friends with Walt Whitman, the gay poet of Nature, who corresponded with Edward Carpenter, a gay Pagan socialist vegetarian whose writings were influential in the Pagan movement at the beginning of the twentieth century. It is probably because of the Transcendentalists that Paganism has so often been referred to as a “Nature religion” according to Chas Clifton, an American scholar of Pagan Studies. Most Pagans and many Unitarians believe that the Divine (or deities) is/are immanent in the world; an important prerequisite for treating the planet with respect. Another very important idea in the contemporary Pagan revival, and for many Unitarians, is the worship of the Goddess or of Goddesses. Unitarian feminists were vital in the process of exposing the patriarchal nature of religion. Names such as Elizabeth Cady Stanton, one of Theodore Parker’s congregation, who wrote The Woman’s Bible, and Frances Power Cobbe, who edited a 14 volume edition of his writings, are very important in feminist history. The Goddess is immanent in the world, not transcendent. She is associated with Nature and the wilderness. She is often seen as a mother who gives birth to the Universe and who also IS the Universe. But she is also the wise crone and the wild maiden. She is the embodiment of compassion and wisdom. She is not interested in imposing laws from on high, but on the emergence of harmony at the grass roots level. She is much more than a Virgin Mother – this is an image which has been very damaging to women by holding out an unattainable ideal and denying the validity of sexual pleasure. Her worship includes sacred sexuality. Before there was the Earth Spirit Network, there were the feminist theology activists in Unitarianism who campaigned for more inclusive language; they included Ann Peart. Theodore Parker was a Transcendentalist minister who was shunned by the more conservative Unitarians in the Boston area, but eventually gathered a congregation of about 300 in an old theatre; they included Barbara Bodichon, feminist and later a Pre-Raphaelite artist; and Elizabeth Cady Stanton, a famous American Unitarian feminist. Parker was a noted campaigner against slavery; but he also often referred to God as a Mother, and believed that God is immanent. Norbert Čapek also viewed the Divine as immanent in humanity, and wrote the famous and much-loved hymn, Mother Spirit, Father Spirit. He also designed the Flower Communion, which was a radical expression of what it meant to be Unitarian in a country occupied by the Nazis, and a celebration of individuality, as well as a form of communion that his congregation, many of whom had rejected conventional Christianity, could celebrate. During the Second World War, the Unitarian Service Committee was rescuing Jews from the Nazis, and needed an official symbol to put in their passports to show that they were under the protection of the Unitarian Service Committee. Rev Charles Joy, the leader of the USC, commissioned Hans Deutsch to produce a symbol, and wrote to the General Assembly back in America, that it was like a Greek or Roman chalice. So, pagan and pantheist ideas have been in circulation in Unitarianism since it began; they are not a recent introduction, but an integral part of Unitarian engagement with the world, because both Paganism and Unitarianism are world-affirming. From Natural Religion to Nature Religion: Pagan and Pantheist tendencies in Unitarianism by Yvonne Aburrow is licensed under a Creative Commons Attribution-NonCommercial-NoDerivs 3.0 Unported License. Note on names: In the UK, the movement is called Unitarian and Free Christian (Unitarianism for short); in the USA, it is Unitarian Universalism, as a result of the merger of Unitarians and Universalists in 1961; in Canada, it is Unitarianism. In 2014, I was able to get to an archery club to practice archery. Sadly I only got one opportunity for archery in 2015, but I love it. When I am doing archery, I am totally in the moment, totally focussed on hitting the target, and how my body fits with the bow (though probably insufficiently focussed on the latter). I am not thinking of anything else. 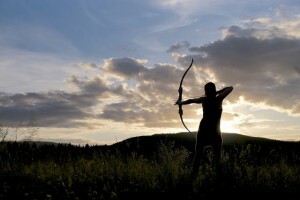 For me, archery is embodied spirituality in action. This probably applies to any skilled physical activity, such as martial arts, dance, massage, woodworking, crafts, and so on. The interesting thing about archery, for me, is that it involves stillness and focus as well as action. You have to get your body to learn the correct posture, until it becomes instinctive to get your arms at the right angle, your legs in the correct position, and so on. It is also true that letting go of the outcome and focusing on the activity can bring success. At one point, I was given a Mongolian bow, with the aim of hitting a balloon. I was pretty sure I wasn’t going to hit it, so I relaxed, and I did hit it. Becoming an archer was the realization of a childhood fantasy. What Tolkien-obsessed kid wouldn’t love to shoot a bow and arrow? … Realizing—at 30—that I could finally have that bow I always wanted was surreal and exciting. I taught myself out of a book and dove right in, joining an archery club the same month. Longsword resulted from lots of time spent with traditional archers, who often double as history enthusiasts. And where archery helped me in developing a relationship with Herne the Hunter, I’m really curious to see where fencing will take me. In the medieval world, archery was not considered knightly, because you hit your target at a distance. But it could be used for hunting, and of course was used to devastating effect in the battle of Agincourt. Robin Hood is one of the most famous archers in legend, and there are many stories of his accuracy. My favourite is the one where his opponent fired his arrow right into the centre of the target, but Robin split his opponent’s arrow in two. Artemis and Diana, the virgin huntresses, are also associated with the bow. The crescent moon is often depicted as Diana’s bow. Shen-I the Excellent Archer is a character in Chinese mythology. Once upon a time, all ten suns rose together in the sky. Shen feared that the Earth was in danger of drying up, so he took his bow and shot down nine of the suns. The hearth is the heart of the home. A home without a hearth lacks focus (or perhaps the focal point of the living room becomes the television). This is interesting because the word focus is Latin for hearth. So the concepts of hearth and home were linked in Roman thought too. In ancient times, the hearth, as the sole source of heat in the home, would have been massively important. Now that we have radiators and central heating, we tend to forget about the importance of the hearth. But in ancient cultures, the hearth was the place where you made offerings to the family gods and spirits, the lares and penates (household spirits in Roman religion). The notion of ‘familiar spirits’ originally meant the deities and spirits honoured by your family. In Vedic culture, the making of the sacred fire was a very important ritual. Several cultures have domestic spirits, often associated with ancestors, such as the Cofgodas (cove-gods) of Anglo-Saxon paganism. The English and Scots believed in house Brownies, also known as urisk in Lowland Scots. Slavic cultures believed in Domovoi, which were originally ancestral spirits in Slavic paganism. There are also Aitvaras (Lithuania), Dimstipatis (Lithuania), Ev iyesi (Turkey – known as Sahab or Kimsene in Anatolia), Hob (North and Midlands of England), Kikimora, aka Shishimora (Russia), Kobold (Germany – possibly related to the Anglo-Saxon cofgod), Olys’ (a hearth spirit of the Komi people of northern Russia), Lares (Ancient Rome), Pūkis (Latvia), Pukys (Lithuania), Tomte (Scandinavia), and Zashiki-warashi (Japan). In cultures that use stoves, they have also acquired resident spirits and folklore as well. 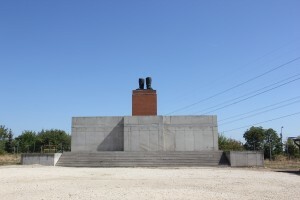 Domovoi live in stoves. In Tove Jansson’s Moomintroll novels, there is an ancestor who lives in the stove. In Swedish, he is called Förfadern, similar to the English word forefather. 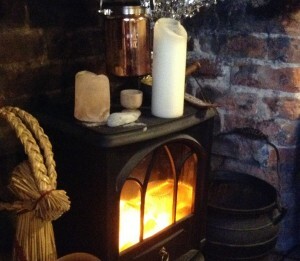 So, from this brief survey of the folklore, we can see that the hearth is traditionally the place where you honour your ancestors and household gods and spirits, usually by making offerings to them. The fire would have been kept burning all the time, so it would be a good place to make offerings. Old English heorð “hearth, fireplace, part of a floor on which a fire is made,” also in transferred use “house, home, fireside,” from West Germanic *hertho “burning place” (cognates: Old Saxon and Old Frisian herth, Middle Dutch hert, Dutch haard, German Herd “floor, ground, fireplace”), from PIE *kerta-, from root *ker- (4) “heat, fire” (see carbon). Hearth-rug is from 1824. Hearth-stone is from early 14c. Lares (/ˈlɑːriːz/; Latin: Larēs, [ˈɫa.reːs], archaic Lases, singular Lar), were guardian deities in ancient Roman religion. Their origin is uncertain; they may have been hero-ancestors, guardians of the hearth, fields, boundaries or fruitfulness, or an amalgam of these. So, if you want to recreate these customs but you don’t have a hearth, you could have a chimenea or a firepit in your garden, or a shrine with candles in your house. If you do have a fireplace with a real fire, or perhaps a wood-burning stove, then you could have a bowl for offerings on the hearth, and set aside food from your meals for the ancestors. You can also make offerings in the fire itself. Of merry crickets by my country fire. Warm by a glitt’ring chimney all the year.